Michael McDowell SC, for the SBP, said the dictionary definition of a buccaneer is a pirate usually operating in the Caribbean and asked Mr O’Brien was he seriously saying it was “a complimentary term”. Mr O’Brien claims the articles wrongly meant he was among a “gang” of 22 borrowers identified with the bankruptcy of Ireland’s banking system and injured his reputation. The defence denies the words mean what Mr O’Brien alleges, denies defamation or malicious publication and has pleaded “fair and reasonable publication on a matter of public interest”. 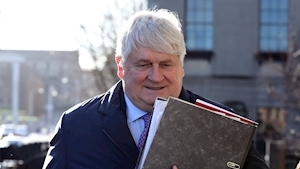 Journalist Tom Lyons told the court articles about the Irish banks’ 22 biggest borrowers in 2008 were in the public interest and identifying Denis O’Brien as one of the 22 was “not malicious”. Mr O’Brien was named among 22 people identified as the biggest borrowers from Irish banks in 2008 in an “astounding” report by Price Waterhouse Coopers to the Government in November 2008 concerning the exposure of Irish banks, Mr Lyons said. Articles published by the Sunday Business Post in March 2015 “faithfully reported” the PWC report and there was nothing malicious in including Mr O’Brien, who was “one of the good guys” in that he had paid off his loans over five years. The PWC report put Mr O’Brien’s total indebtedness to Irish banks at €1bn, including some €785m to Anglo, and he was listed in the SBP articles in the same sequence as in the report, he said. The articles named all 22 because that was demonstrative of the concentrated risks in the banks, they were lending too much money to too few people which was “a big deal” in the PWC report. He said Mr O’Brien was in “strong financial shape” in 2015 as he was three years earlier when Mr Lyons was involved in writing another article, in the Sunday Independent, about Anglo Irish Bank’s top 13 borrowers. There was a “fear factor” about including Mr O’Brien in the SBP articles but he and SBP editor Ian Kehoe decided they had “to be brave” and not leave Mr O’Brien out “because he is a special case or could sue us or affect our job prospects into the future”. The PWC report addressed an “extraordinary time” in Irish life and the Irish public “deserved the answers”. Mr Lyons was giving evidence in Mr O’Brien’s continuing action alleging he was defamed in the articles of March 15, 2015. Mr Lyons said he was never of the view Mr O’Brien’s borrowing brought down the country.